I've mentioned that I squeak when I'm happy. I may have full-on shrieked for pure joy when I saw this post on Nouveau Cheap. 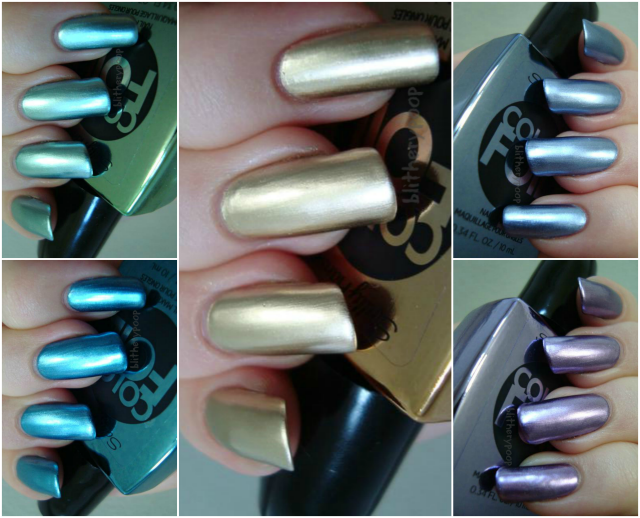 I loved the original Chrome Nail Makeup and Color Quick Chromes and I still have a few. This new bunch brings back tons of happy old polish memories for me...and maybe for you too. I wound up with five of the ten shades, some bought at CVS and others at Target, since I had coupons for both stores. If you're new to chromes, you probably don't know about their reputation. I'll be blunt. Chromes are divas. Get them right and they're glorious. Slip up and they look awful. There's a trick to these that has made them so easy though. I can't say I got them perfect, because I didn't, but...well...judge for yourself. I'd call that damn good, no? The bottles say to shake well and apply without base or top coat. Part of that is right, but not all. To get them to look their best, you need to throw out the polish rule book. Shake the hell out of them and immediately apply them over something smooth and dry. That can be an old mani or just base and top coat (big thanks to a few Nail Boarders for that tip! ), but they do best if they're the top layers. Two fairly "loose" coats worked best for me, with a little drying time between. I say "loose" because the more you worry about brush strokes, the more likely you are to get them...or worse. 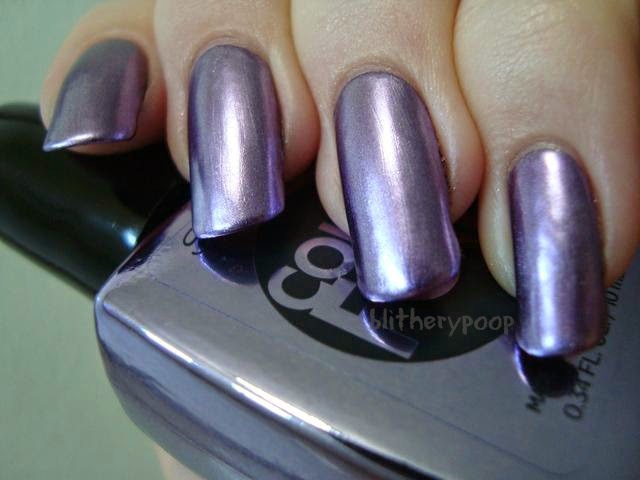 If you go back over the same spot twice, the polish will go lumpy or even come off in clumps with the brush. The chrome finish "activates" as it dries and it will look smoother dry than it does when you've first put it on. They're touch-dry quickly, but can still be dented by a sharp edge for at least an hour after application. This is another one of those times when they all have almost exactly the same formula, so my individual reviews will be more about the color itself and the method I used, since I varied it a bit. One caution I have to give is that they have camphor. Some people (and some pets) have sensitivity issues with it and it does give these polishes a strong, medicinal smell which takes a little while to fade. It's not unbearable to me, but it is noticeable and you may want to consider that before buying any Color Foils. I didn't use top coat over any of these. Liquid Gold is a yellow-toned gold. This is my happy place. Right here. I can't tell you how thrilled I am that chromes are back! Polish will never give as strong a mirror effect as something like Minx and none of the Color Foils I've tried are as reflective as OPI Push And Shove, but still...this is glorious! The collection has two gold shades, but I picked this one since Yellow Gold looked a little harsh and greenish in other people's swatches. Liquid Gold is really flattering on me and I seriously might need a second bottle. For this swatch I used NYC Matte Me Crazy and Seche Vite under Liquid Gold. Any quick dry topcoat should work, but Seche Vite is fast enough that I was able to apply Liquid Gold after just a couple of minutes. The two photos above both show two coats of Liquid Gold, but I took photos of the first coat too. With just one coat I seem to get tiny bare patches and the brushstrokes are more obvious. I've actually worn Liquid Gold as a full mani. I was sick last week and just didn't have it in me to do a new mani on Friday. You know I'm sick when that happens! I had mismatched swatching nails and needed to do something before I went to work. One of my favorite Nail Boarders, laikabear, had suggested that maybe these might be the new "nail sweatpants". That's what Nail Board used to call mattes/suedes, since you can just slap them on and go. I wouldn't really call Liquid Gold SFW, but I shrugged and went with it anyway. At least my nails would all be the same color. I applied two coats of Liquid Gold over my mismatched polish while standing at my desk, then did an equally half-assed cleanup and went to bed. It didn't look great, but it survived a shower and a couple of work nights without topcoat and I put in almost no effort. So maybe not sweatpants, but gold lame track suit pants? If I'd done it a little more carefully and slowly...and...you know...sitting down, it would have looked fine. Purple Alloy is a dusty purple. It's a tough call, but I think Purple Alloy might be my favorite. I think. Maybe. It's more purple on the nail than the bottle would suggest. Really they're all pretty far off from the bottle colors. This time that was a pleasant surprise. This is two coats over a previous mani. Leaden Lilac is a smoky periwinkle. This collection even caught Nichole's eye and she's posted this one already. On me it's not the least bit purple, but isn't quite as blue as it looks here. It's a really fascinating color and I'm wearing it as a full mani right now. This is two coats over two coats of Nicole by OPI Strengthener Plus, a coat of NYC Matte Me Crazy, and a coat of Seche Vite. Cobalt Chrome is medium blue. I'm kinda shocked that this isn't the one Nichole bought. It's not as bright as it looks here and it's slightly greener. The bottle color is closer to the polish color on this one than on any of the others I've tried. It's Purple Alloy's strongest competition for the title of "my favorite". Minted Metal is a soft mint green. The bottle color is way WAY off here. It's much lighter than I expected and when I first applied it I thought it was blue. They all get shinier as they dry, but Minted Metal full-on changed colors. Weird. This is two coats over a previous mani. Bottom line: Once you get the hang of them, these are actually pretty well-behaved as chromes go. Putting them over a smooth, dry coat makes all the difference in the world. I love them and I might go back for a couple more...and maybe backups of a few. These are LE, after all. The only one I'm not completely crazy about is Minted Metal. It's not terribly flattering on me and I wish it was greener. The rest are top notch! I need to add down at the bottom here that I had absolutely no luck at all trying to stamp with any of these, but I've never gotten reflective chromes to stamp well. I'm wondering if it's because I use a squishy XL stamper. Have you gotten them to stamp? These dry on the stamper for me. I have found that if I do my base color and apply another sticky base coat on top (CND Stickey, Orly Bonder, etc) then my dried on stamp will transfer. These are definitely high maintenance. But they're worth it!